Once a forgotten backwater, Beit Shemesh is now a major city with 100,000 residents — and soon, Prime Minister Binyamin Netanyahu said Wednesday, it will grow to 250,000. “This city started out as a village for immigrants, and slowly but surely developed,” Netanyahu said at the gala opening of the upgraded access road to Beit Shemesh. “Soon it will have a quarter million people, religious and secular, veteran Israelis and new immigrants,” Netanyahu said. Road 38, originally a twisty, bumpy — and relatively unsafe — road, is now a four-lane (two in each direction) modern route, which promises to cut commuting time for Beit Shemesh residents to Tel Aviv or Yerushalayim by as much as 20 to 30 minutes. The road has been completely repaved in one of the biggest and most extensive road construction projects in Israel, with construction going on for the better part of a decade. During that time, delays were endemic, with drivers sometimes taking 45 minutes to get from the Tel Aviv-Yerushalayim road to Beit Shemesh, with traffic snarled for the entire 10 kilometers of Road 38 during rush hour. 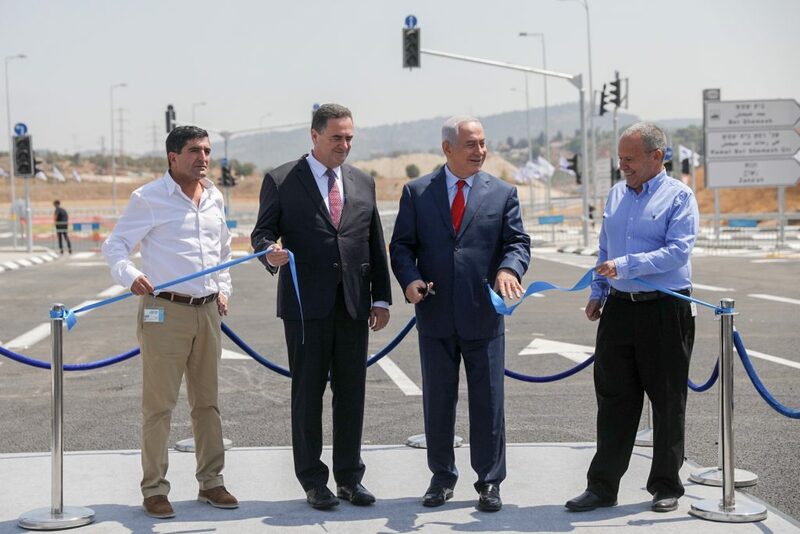 Attending the event with Netanyahu was Transportation Minister Yisrael Katz, who said that the new road “will cut commuting times significantly, as well as increase safety, on a road that was for years considered one of Israel’s most dangerous. The new road will also make it easier for Beit Shemesh residents to connect to main highways and get to where they have to go more quickly.” Also attending the event were Beit Shemesh Mayor Rabbi Moshe Abutbul, Chairman of the Netivei Yisrael construction firm Nissim Peretz, and officials from Beit Shemesh and other towns along Road 38. On a tour of the new road, MK Rabbi Moshe Gafni (United Torah Judaism), chairman of the Knesset Finance Committee, said that “we have struggled for many years to get the Transportation Ministry to understand just how important upgrading Road 38 was. There is no shortage of highways in Israel that require upgrading, but Road 38 is more than just another road — it was a road paved in the days when Beit Shemesh was an immigrant village, and was not up to the level of serving as the main access road to a major city, which Beit Shemesh now is. “I am happy that we were able to succeed in this struggle, and now Beit Shemesh residents can enjoy the results of our efforts and drive on a modern road. This road will bring Beit Shemesh to further development and growth in business and industry, which will eventually secure the city’s financial future,” he added.